Éléonore Dupré is French, and a student at the Institute of Political Studies at Aix-en-Provence in France. In the course of her studies she spent a six-month internship with the Sarva Seva Farms Association in India. Her objective was to study women’s empowerment in the ASSEFA villages. In this article she recounts her main observations. ASSEFA has been working since 1968 to support the poor in taking control of their social, economic and cultural lives. ASSEFA now works with 10,150 villages, covering a total population of 5 million people, and 7 States of India! In a remote village in Tamil Nadu, in the middle of a makeshift hut, a young woman in rags is squatting: she is preparing the dinner. She left school at 12. Some years later, she was married by her parents to a man from a neighbouring family. She has never travelled beyond the nearest town, Natham, a mere 7 kilometres away. In the same village, at the end of a dirt track alley full of children at play is another house. It is new and spacious. A woman is sitting there on the veranda, together with other women. She welcomes us with chai and vadai1. She proudly speaks of her three children who are following their secondary studies in the regional capital. She talks about the financial success of her family, to which she has largely contributed. She talks about her role in the village, as president of a women’s self-help group (SHG2). She is responsible for organising milk collection and processing. Her activity has provided her with a new status both within her family and the village. She enthusiastically describes the land that they have been able to buy and farm, thanks to the milk business. She confidently describes how she now has meetings with the director of the State Bank of India, how she travels freely and alone to the other states of India. And this activity does not just make money for her, but for all members of the SHG, who have all increased their income and improved their living conditions. These two stories both take place in the same village, Mathukarampathy, and they describe one and the same woman, Kala. The first description a flashback to fifteen years ago, the second describes her life today. How has this change come about? What are the factors that have so changed this woman’s life? Although it is impossible to single out the variable factors that enabled this change to occur (they are linked to the important change that Indian society has undergone in recent decades), I shall try to demonstrate the role of the SHGs in supporting Indian women’s empowerment. A support group is a voluntary association with a maximum of twenty people. The members live close to one another and have shared interests. They are democratically constituted, and have no political affiliation. The group meets regularly to constitute their savings and discuss any problems they may have. These shared savings provide members of the group access to loans, with each member having their turn. A key factor of the success of these groups is their uniform nature: they are generally made up of women (empirical studies have shown that women’s groups tend to be solvent); they come from the same village (peer groups guarantee regular repayments). The term empowerment can be defined as a process that enables people or a group to increase their ability to make decisions and transform them into actions and desired outcomes. So how do SHGs increase women’s empowerment? In the light of bibliographic research and field experience recorded by ASSEFA3, the following hypotheses can be advanced: (1): The self-help group has contributed to genuine material change (well-being of the women and their families), as well as psychological change (the women become actors of their own lives4). (2) The success of the SHGs is based on several economic and social variables that condition women’s empowerment; the viability of the micro-credit system and genuine control of women over the loans that the take out. (3) The support of the local NGO can help meet these socio-economic challenges. Access to micro-credit enables women to cope with daily and exceptional expenses as well as facilitating and improving their living conditions. The self-help groups ensure that women have access to loans to launch economically profitable activities and to cover the cost of ceremonies, education and housing or healthcare. An example of this is how in the SHGs coordinated by ASSEFA, women can take out interest-free loans to cover healthcare expenditure. The many different opportunities and services (housing, education, healthcare) are not limited to women alone, but obviously also cover their entire families. The case studies, like the one presented above in our introduction, underline how much the general living conditions have improved. The self-help group is not just a financial institution, it is also a forum where the women gather to discuss the issues that were taboo in the past (domestic violence, harassment for dowry, etc.) and to stand together in facing the difficulties that life has thrown at them. Women in the self-help groups in ASSEFA have, for example launched social programmes such as maternity and bereavement support (Sarvodaya5, a sort of social security system), as well as group marriages to help families cut down on the expensive organisation of the ceremony, which is an important cause of indebtedness. Women now have access to jobs that were previously reserved for men (in the civil service, as vets etc.) 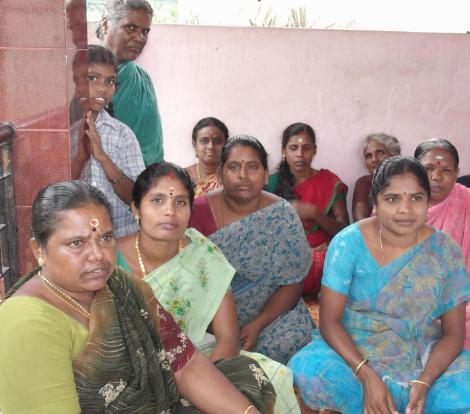 through their commitment to the self-help groups. The SHGs provide a real springboard to seizing new opportunities, thanks to the training they can provide as well as the means and support. They enable women to become actors of their own lives and to overcome the inferior status that is often still theirs in Indian society. The success of the group and the way in which it benefits women is based both on the viability of the micro-credit system as well as the control that women have over the loan. Many voices have been raised to criticise the relevance of micro-credit and the SHGs in alleviating poverty and its related issues, particularly those that affect women6. But the micro-credit institutions based on women’s groups have produced very positive results: peer-pressure7 from within the group is an efficient guarantee that ensures the financial solvency of the group. Swain8 adds the association of SHGs with NGOs is a key element that guarantees the viability of micro-credit institutions. The ASSEFA NGO study is based on this argument, as it strengthens the micro-credit system by providing training to the SHG leaders and creating horizontal structures (networks of SHGs), as well as vertical ones (SHGs and different levels of coordinating institutions, such as the Sarvodaya Mutual Benefit Trust, and Sarvodaya Nano Finance Limited). These structures jointly guarantee the efficient management of the group, as well as providing greater economic support. It is however necessary to underline the many social changes that this new status acquired by women through the self-help groups implies, as well as to outline the possibility of negative repercussions linked to women’s involvement in these groups. The wheel of change in society also involves some inertia that is the vector of codes and customs. As a result of the new income earned by some married women, some husbands tend to cut down on their financial support within the marriage. In the majority of cases women were also faced with a heavier burden, as a result of their involvement with the SHG. Furthermore women do not always maintain control over the loans. In the worse cases, women are the mere intermediaries between the bank and their husbands. The final observation was that this new access to micro-credit has led to an increase in domestic violence in couples where women were involved in the SHGs; this is a symbol of the resistance to change in society9. The process of empowerment therefore has important repercussions on society, as it undermines the codes and customs. As ASSEFA is aware of these issues in Indian society, and of the micro-credit system, they defend a holistic approach to development, with a view to rectifying these paradigms. Rather than consider the SHGs as tools to guarantee the efficiency of micro-credit, micro-credit is perceived as a tool to support women in the SHGs to improve their living conditions. The ASSEFA SHGs also include many other activities such as milk collection for five plants that are cooperatives, social activities like collective weddings and healthcare and funeral mutual funds. They also involve the ASSEFA schools’ management and access to civil service jobs, particularly in the Panchayats, the grass-roots political unit in India. By supporting the SHGs, the ASSEFA NGO increases the openings available to women. The overall holistic approach to development of ASSEFA places women at the heart of development. The SHGs play a key role in all the activities of the 10,150 villages involved. In the precise case of micro-credit, a solidarity mutual fund is added to the “group pressure” to help repay the loans. Thus linked to the SHGs through “Trusts” they own their financial institutions. This surely explains why the micro-credit performance in ASSEFA is recognised as one of the most successful there is, with a repayment rate of over 99%. Although this is the symbol of success of ASSEFA, it only represents the economic dimension of the equation. The personal history of Kala is one of thousands. It is the story of how small steps can change women’s lives, to become giant leaps.